You know those days where you're so tired you literally feel like you just can't move one more muscle. You fall into bed, barely remember to set the alarm then roll over pretty much asleep already. That's when you feel the stabbing pain of the earrings you forgot to take off, rip them out of your ears, throw them on the night stand and forget the world. I live that scenario fairly frequently, and it's usually a day or two later that I realize those earrings I tore off got swept to the floor when I fumbled for that awful alarm clock the next morning. So when I saw a cheap, plastic framed mirror at the thrift store, I knew what had to be done with it! Yep, this matches my room much better. I'm always amazed what you can do with a few layers of paint. Now let's see if I can actually hit this thing when I throw earrings at it! While I'm talking about stuff on a bedside table, I should show you what mine looked like when Mr. Concrete brought it home from a yard sale for $15. Nothing really wrong with it, but the cherry just wasn't working. And yes, I did snap a picture with no regard to showing you my dust. Don't you think it works so much better in white? Have an awesome week my peeps!! 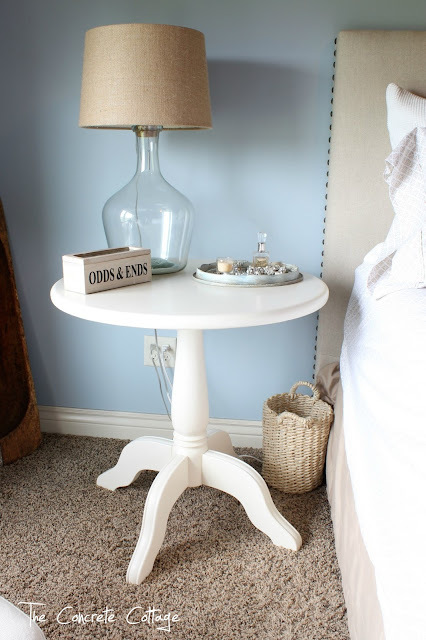 To see how I made the glass bottle lamp on the nightstand, check out this post! Wow this is beautiful. What a great idea to turn a mirror into a tray. I just love it. I would love it if you would share this over at my link party that is going on right now. Your tray turned out great! It looks perfect with all the pretty jewels and perfume on your little white table! Pretty, pretty...I swear I need to go junkin' with you. I never find things that great at the thrift store! 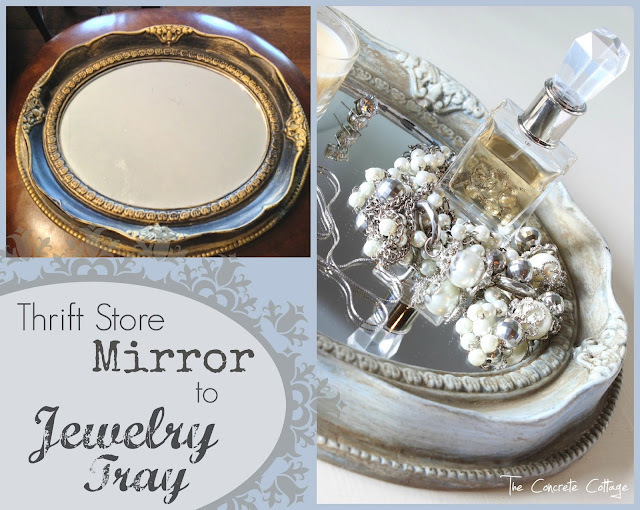 Your jewelry tray is just beautiful! It looks like a real antique! And the table looks darling in white - so fresh and pretty! Love your jewelry tray. Thanks for sharing it at my Twirl & Take a Bow Party. Stop by House on the Way tomorrow to see it featured. Be sure to grab a featured button too. I can't get over the fact that the mirror is made of plastic! It looks so expensive in the pics, esp after the update! I'm jealous of your find and excited to be your newest follower. What a great idea...so beautiful!